The interminable summer is over: The Jets and Giants begin their seasons this Sunday. We began our Giants preview on Tuesday with a look at some of the team's free-agent acquisitions, and continued yesterday with a week-by-week schedule and predictions. Today: A look at what the 2011 season means. Tomorrow: A preview of week one's game against the Redskins. Jerry Reese says the Giants will make the playoffs this year. Eli Manning, when asked on the radio if he'd put himself in the same class as Tom Brady, says that he would. And lest you think that Giants' roster doesn't really impress on paper, the team's spokesperson took to Twitter to remind us all that games are not played on paper. (He also has some thoughts on what you can do with that paper of yours.) That's a fair amount of confidence for a team that's missed the playoffs two years in a row (even if none of those things would even register a reading on the Rex Ryan swagger-o-meter.) But whether or not the Giants are trying to convince their fans that their team is good, or merely not terrible, is besides the point: After all, preseason chatter counts as little in the standings as preseason games do. But beginning Sunday, winning football games matters very much, and over the last few years, this team hasn't quite won enough of them. Three years ago, despite having clinched the home-field advantage throughout the NFC playoffs, they lost to the Eagles in their postseason opener. Two years ago, they finished .500, and missed the playoffs entirely. And last season, despite a respectable 10–6 record, they missed out on the postseason for the second straight year. Are there teams who've been less competitive over the past three seasons? Of course. But since winning the Super Bowl in February of 2008 — and especially since the beginning of the playoffs the following season — the Giants have mostly settled for mediocrity. Speaking of that Super Bowl: The honeymoon period is ending, if it hasn't already ended. There were times last season where it looked like Tom Coughlin was on the hot seat. He'd wind up with an extension to keep coaching the team through 2012, but if the Giants get off to a slow start — or if by year's end, appear to have taken a step backwards — you can count on sports talk-radio phone lines to light up with calls for his firing. Is that fair? Not necessarily, and particularly not after an off-season (and an injury-filled preseason) that didn't do much to fire up the team's fan base. 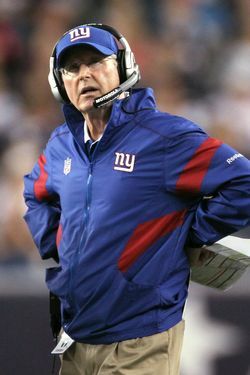 Coughlin will coach the team he was given (or, at least, the members of that team who aren't sidelined with injuries). But even the man who led his troops to victory in Super Bowl XLII can't live off that season forever. The ultimate goal for the Giants, just like it is in theory for every NFL team, is to win the Super Bowl. But more realistically, even making the playoffs would be a step forward, especially with all the injuries they've suffered before the regular season has even begun. But all along the way, they'll be out to prove the pessimists in their own fan base — ones with good reasons to have their doubts about the 2011 Giants — wrong. No matter what anyone in the front office says, that's not a great place to be on the eve of a season. But it's nevertheless where they are.